The Polish Jew Abraham Jakub Stern (see biography of Abraham Stern), a mathematician, inventor, translator, and censor, was born in 1768 in Hrubieszów, in a poor Jewish family. Around 1800, while working at a clockmaker’s shop in his home town, he was lucky to be noticed by Stanisław Wawrzyniec Staszic (1755-1826), a leading figure in the Polish Enlightenment: a Catholic priest, statesman, philosopher, geologist, writer and translator. Staszic, who studied at the Hrubieszów and Lublin secondary school in early 1770s, bought an estate in Hrubieszów in 1800. Staszic obviously noticed the extraordinary talent of the humble clockmaker and encouraged him to devote himself to the study of mathematics, Latin, and German, later sending him to Warsaw to continue his studies. His first computing machine Stern designed around 1810, and in 1811 he sent a report to Staszic, outlining the device and asking for financial help. Later on he designed two more calculating devices. His inventions became popular, at the time of their development. In 1816 and 1818, Stern demonstrated his machine to the Tzar of Russia Alexander I, who received him cordially and granted him an annual pension of 350 roubles, promising, in case of his death, to pay half of this sum to his widow. For his inventions, Stern was admitted to the Warsaw Society of the Friends of Science (Warszawskiego Towarzystwa Przyjaciół Nauk, the predecessor of the Polish Academy of Sciences), first as a corresponding member (1817), then as a qualifying member (1821), and finally as a full member (1830). He presented his inventions multiple times at the Society’s meetings. 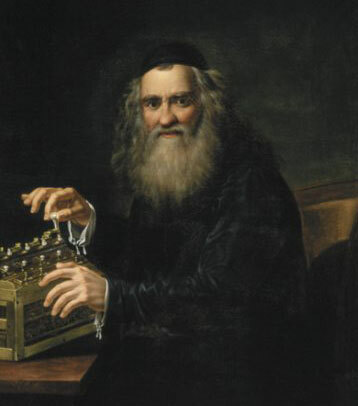 Stern was a father-in-law and heavily influenced another inventor of calculating machines—Chaim Zelig Slonimski. 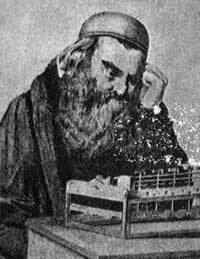 Stern most probably had strong influence also over another Polish Jew and inventor—Izrael Abraham Staffel. Stern presented to the Society three calculating machines. 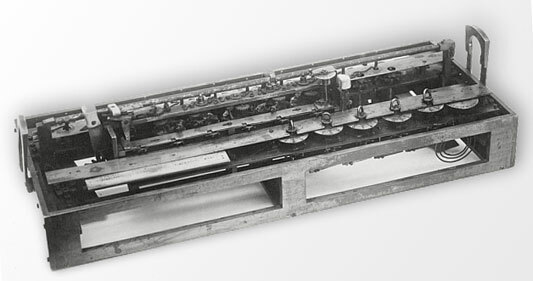 First machine for four arithmetic operations was designed around 1810 and was presented on 7 January, 1813, then a different machine for extracting square roots (presented on 13 January, 1817), and finally the combined machine for four operations and square roots (30 April, 1818). A lengthy description of Stern’s machines had been given by himself, and you can see it below. Unfortunately, an original of any of his machines did not survive to the present time, only a later replica of one of the machines, shown below. There is also a low quality reproduction of Stern with one of his calculating machines (see below). For the third time, in this earnest place of gatherings of the Society, comprising a selection of learned and enlightened men, I reveal the fruits of my thought—first in the month of January 1813, I presented an invention of a Machine for 4 arithmetic operations—secondly, in January of the current year 1817, an invention of the Machine for extracting roots with fractions—and then finally today, the 30th of April of the current year 1817, an invention combining both these Machines into a single one. 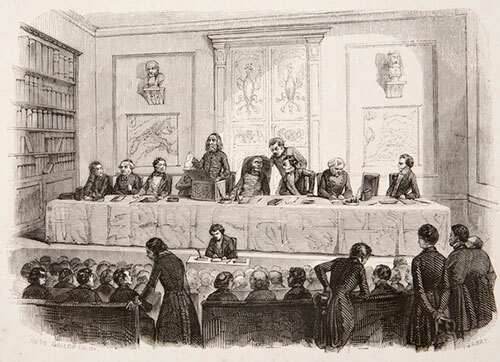 This memorable day is the anniversary of establishing the glorious Warsaw Society of the Friends of Science and honoring it with the title of a Royal Society. I consider myself to be extremely fortunate that on this celebrated day, I can report concerning my inventions, regarding both their historical development and the thought that inspired them as well as regarding properties of said Machines. For thou hast made him a little lower than the angels, and hast crowned him with glory and honor. Thou modest him to have dominion over the works of thy hands; thou hast put all things under his feet: All sheep and oxen, yea, and the beasts of the field; The fowl of the air, and the fish of the sea, etc. This feeling of his undetermined power over all of nature, causes him to regard whatever he finds for himself in nature useful for his needs, even though it should be considered more as a luxury. Experience teaches us that many things that initially were luxurious only because of having been used by a small number of people, with time, however, have become so common that they have shifted from the level intrinsic to luxury to the level of essential need. From all this ensues, that when in the mankind a number of needs increases, then by this very thing, the ingenuity in methods and means to meet these needs has to multiply. Since such means are commonly based on physical acts, that is, works of the body, which often become onerous, or even beyond human power, so in such case the mind, as a primary Leader of the Man, makes every effort to invent intermediary means to replace the work of the body, or at least to ease it. Following this purpose, numerous mechanical tools have been invented to protect human physical power and support it. From the depths of this convincing truth, another one equally undeniable have I drawn, that while no one spared efforts to bring assistance and relief to the physical condition, it becomes at least equally necessary to launch a search for mechanical means, which would offer help in human mental activities and relieve the intensity of thought; since the intensity of thought, as it is known, not only often impairs the subtlety of organs, deadens the wit, degrades memory, but also, even causes weakening of the body. I considered arithmetic or calculation science such a mental activity, one that was necessary, but through an intensity of thought, one that could be harmful. In it, the first 4 types of operations, that is, Addition, Subtraction, Multiplication and Division are the main principles of all calculations, insofar that all other calculi are only the result of combinations of the said 4 kinds. And even though all 4 arithmetic operations, in general, require an uninterrupted presence of mind, that if for a moment gets distracted, a calculation cannot be accurate; since Multiplication and Division, for the reason of higher and more continuous intensity of thought, turn out to be the most difficult ones and therefore so often are subjected to errors. In regular calculus, we do not have and even cannot have a test convincing us whether any error was made; this is because a test performed by a reverse calculation, for example, Multiplication by Division, or Division by Multiplication, does not yet constitute a sufficient proof, for it means to test a mental activity by another mental activity. Since the repeated mental action, intending to serve as a test, is subjected to an equal error as in the primary calculation, this error in a test could have obstructed an error made in the calculation itself, and made it invisible. All these remarks became for me the reason to invent an arithmetic Machine based on mechanical and arithmetic principles, with the assistance of which even people knowing only counting and numbers, all 4 kinds of calculations, and therefore all the other calculi, without slightest application of thought to it, easily could accomplish. And because I thought it to be just, in such an important subject, not to rely solely on the principles of the theory of the mechanism, on which my invention has been based, insofar the slightest error in these principles could have disproved the entire construction of the invention, therefore for better conviction, I elaborated for testing a model of such an arithmetic Machine that worked. And even though the Machine was not of a durable construction, and the required accuracy in the first, rough design, could not have been achieved, however, it exactly performed all the arithmetic calculations, so far that it proved the reality of this important invention. In the month of December 1812, I submitted this invention for the consideration of the respectable Royal Warsaw Society of the Friends of Science. This Eminent Society, having assessed the invention as corresponding fully to its purpose, deigned to deliver to the public a message about it, in its gathering on January 1813. I have stated then, that I have planned to make another Machine, made of metal, in a way strong and durable. And although such an endeavor in particular at the initial stage, required time and significant funds for covering expenses, which by then a critical war situation of the Polish state, of which I am a compatriot, made it even more difficult for me, however, not saving efforts on my part, this statement of mine I have put into effect, so far that working continuously on this invention, I have finished a Machine for 4 fundamental arithmetic operations, completely of metal made with the finest work, and performing 13 digit operations. In conjunction with work on this arithmetic Machine, I also worked on another, by far more difficult, invention of a Machine for extracting roots with fractions. The difference existing between only arithmetic operations and extracting roots already shows the level of difficulty; because in the former, there are always at least two known numbers given and the third unknown is searched for, but in extracting roots, there is only one known number given, and the other one unknown, that multiplied by itself equals the given number. Admittedly I learned that I ventured into such an abyss, from which a recovery is subject to numerous difficulties, both regarding the implementation of a thought as well as the huge costs, which a carefully elaborated plan definitely required. But no difficulty could oppose my keen willingness to finish the invention, which from various points of view seems to be important, both for the intention proper, the relief in the intensity of thought and counteracting unintentional errors, and to create a completely new mechanical means, included in this invention, which could apply great benefits to mechanical tools in other objects. Thanks to the Almighty, I have passed this difficult and dangerous path, too, and the Machine for extracting roots with fractions I have led to the intended goal. This invention just like the first one, I have submitted for consideration of the glorious Royal Society of the Friends of Science, about which the public has been informed at the past January gathering of this Society. This way, then, these two inventions, two separate Machines have been formed, one for the 4 arithmetic operations, and another for extracting roots. I began thinking further on the ways, which these two inventions could combine into a single Machine. It seemed to me, initially, to be impossible, indeed. But finally, at this point mechanical ingenuity showed me the means to put my intent into effect. The importance of this thought so overwhelmed me, that to all unpleasant things stemming from shortages I have been insensitive, doubling my efforts, so I could make this combination sooner. Thanks to the Highest Being, in this subject I did not fail either. I can say this boldly, since I am referring to the convincing proof, that is, before our eyes: a Machine, which accurately performs all 4 arithmetic operations, as well as extracting roots. If I wanted to venture into the details and explanations of all principles of the internal Mechanism of this Machine, the purpose would be missed. Because the Mechanism, comprising several wheels of various kind, rotations of a new type, springs and levers, by various means connected with each other, requires an extensive description and many figures, which will be the subject of a work planned for a later date, with figures clearly presenting the matter, but in this treatise clarifications would be an excessive boring of the respected public. Therefore I am moving now only to a brief sketch of the Machine and the explanation of the way of using it, in various arithmetic operations and extracting roots, as well as doing a foolproof test. This Machine has a shape of a parallelepiped, longish and rectangular, in its length by five rows of wheels divided. The first, uppermost row, just like the second one underneath, is composed of 13 wheels based on axles. The wheels of the first uppermost row have discs, on which there are engraved ordinary digits of numbers of which only one number over the aperture is visible. Because the numbers of these wheels correspond to positions of units, tens, hundreds, etc., thus, this row entails trillions. Wheels of the second row, in turn, do not have discs, and serve only as the Mechanism offering movement to the uppermost numerical wheels. Both these rows do not change (their place in the Machine. Behind these rows underneath, there are two rows of wheels, which similarly have numerical discs visible through the apertures, and are placed in a separate base in the shape of a carriage. This carriage with its two rows of wheels is so imbedded in the Machine, that it can easily move on smaller wheels or rollers. The first row in this carriage has 7 numerical wheels on the axles of which there are as many folding cranks. Besides these cranks, on the diameter of a folding crank, there is another main crank which can be inserted and removed. The second row underneath has 8 wheels. Below this carriage, there is a lowermost row, composed of 7 wheels, equipped with numerical discs visible through apertures. This row has a stable and invariable place in the Machine. In addition to these rows of wheels, in top of the Machine there are two more rows of wheels, on which Roman numerals are engraved, visible through apertures. One of these rows has its place above the ordinary numerical apertures of the uppermost row, and the other above the ordinary numerical apertures of the lowermost row. When any of the 4 arithmetic operations is to be performed, then one has to move to the left the handle positioned on the right on the carriage at the second row. As a result of this move, on a carriage on the left hand side, the word Species shows through an aperture, all the numerical apertures of the second row are covered, and thus the Machine is ready for 4 arithmetic operations. If the species of an operation is to be addition or multiplication, then with two handles at the ends of the Machine devised at the right and left hand sides, one moves up, while at the same time the words: Addition – Multiplication show up on the Machine through apertures, and by this the Machine is ready for these operations. If the species of the calculation were subtraction or division, this is done by moving from top down, the same way, words Addition and Multiplication disappear, and in their place the words Subtraction – Division are seen and the Machine by this is ready for to the said operations. In calculations of addition or subtraction, one puts the first number known participating in the problem, in the uppermost row, and the other one in the first crank row on a carriage. The operation is performed by the main crank in the middle of the carriage base, which gives movement to the entire Machine. If only a single circular rotation is performed, then the brake, located on the left hand side of the carriage, stops further movement of the Machine, and at the same time the unknown number searched for, appears in the uppermost row through apertures as a result of the operation. In addition, there is one more convenience in the Machine, that is, because in this type of operation it happens that more than two rows of numbers in the calculation have to be combined, for example, in Registers and Tables, one sets on the Machine the first two given rows, as mentioned above, and by making a single circular rotation of a crank the Machine brakes, one touches the brake with a finger, and the Machine becomes available for rotation. Furthermore, one sets, in the third crank row on a carriage, the third given row, and rotates the crank once again, and so on, acting so until all the given rows are exhausted; at that time, in the uppermost row there will be a general Sum of all the given numbers. However, to prevent an error from squeezing in, when all these different numbers are being added, which can especially happen when the operator interrupts the work, the Machine shows, through the aperture, the number corresponding to the value of how many given rows have been taken to the operation thus far. Multiplication is performed in the following way. One of the factors is set on the crank row in a carriage, and the other on the lowermost row, while on the uppermost row, which is designated for the product searched for, zeroes are placed. After that, one moves the carriage from the right to the left side, to the very end of the Machine, by the handle placed on the left hand side of the carriage. After releasing the handle, the carriage returns by itself, and stops in a position resulting from the nature of the problem. In this position one begins rotation of the main crank. During the rotation, the carriage moves by itself from one number to the other towards the right hand side, back through the end of the Machine; over there, the operation lasts until the ring of a bell warns about the operation’s completion, while at the same time the product searched for appears already on the uppermost row. In this species of operation, the Machine has a particular superiority over calculations in an ordinary manner, that from several given multiplications one can obtain a general product without performing an addition operation, that is, without combining individually calculated products together. This is because in an ordinary calculation, in such case, one has to first calculate a separate product from every two factors, then collect all individual products together and, by addition, derive the general product. On the Machine, however, one sets the first task and operates as long as the ring of a bell indicates to stop; not paying attention to the value of a product, one sets the second task, third, and so on, and when after the last operation the ring of a bell indicates to stop the rotations, at that time the general product of all the tasks appears on the uppermost row. In division, one proceeds in the following way. The dividend is set on the uppermost row, and the divisor on the crank row in the carriage, while on the lowermost row, designated for the quotient, zeroes are placed. The carriage moves towards the left hand side, until the divisor stands straight under the dividend number being greater or at least equal to the divisor. Then a main crank rotation begins and lasts as long as the dividend number becomes smaller than the divisor, at which point one presses with finger a flap situated on the right hand side of the carriage, after which the carriage moves by itself towards the right hand side and stops at the appropriate place, where further operation continues in a similar manner till the end of the job. And when the divisor located on the carriage, standing in its first place, that is, at the end of the Machine on the right hand side, carries the dividend, then the operation is to stop and the quotient appears on the lowermost row. In case there is a fraction, then the numerator appears on the uppermost row and the denominator on a crank row in the carriage. If on the uppermost row there are only zeroes, this means that quotient is a whole number, without a fraction. I am now going to describe the way of extracting roots. If one wants to extract a square root from a given number, first, one has to move to the right the handle at the second row on the right hand side of the carriage, so that at the left hand side of the carriage, the word Species disappears and is replaced by the word Radices in the aperture. Then, numerical apertures of the second row of the carriage open, and the Machine is ready for extracting roots. Next, one has to move the handles at the ends of the Machine from top down, where between the inscriptions Subtraction – Division, one can also see on the Machine the word Extraction. The main crank in the middle of the carriage has to be removed, and the smaller folding cranks replace it in the operation. On the uppermost row, one sets up the known number of a given square, and on the first and second rows of the carriage all zeroes, except at the position of units in the second row, where one places the number 1. At the apertures for ordinary numbers of the uppermost row there are various signs dividing this row into sections, in such an order that for every two numerical wheels there is a sign, that is, at units, hundreds, tens of thousands, millions, and so on. On the said cranks there are identical signs, so that each crank corresponds to two wheels of the uppermost row, for example, the first crank from the right corresponds to units and tens, the second one – hundreds and thousands, and so on. The last sign, at the given number of the square, points to the crank from which the operation has to start, for example, if the given square ends on the wheels of the first sign, then the operation has to be undertaken with the first crank on the right hand side. If, however, a given square ended on the wheels of the second sign, the operation then begins with the second crank, having the same sign. Indicated this way the folding crank unfolds, the carriage moves to the left until the unfolding crank stops in front of the last sign of a given square. The rotation is conducted with this unfolding crank and lasts as long as the number on the uppermost row, in front of the rotating crank, becomes smaller than or, at least, equal to the number positioned in front of the same crank on the second row of the carriage. Next, by folding this crank, the crank to the right of it unfolds, and by pressing with finger a flap on the right hand side of the carriage, the carriage moves by itself to the right hand side, until it is stopped by a folded crank, just in front of the previous section. One performs the same operations as above, for each section up to the last one. After completing the operation, if a given number was a full square, then it is replaced by zeroes and the whole root on the crank row in the carriage appears. Otherwise, except of the whole number root, an additional fraction results, namely, the numerator on the uppermost row and the denominator on the second row in the carriage. To approximate the root in decimal fractions, one has to set on the uppermost row as many sections to zeroes as decimal digits in a fraction we want to have, for example, if the root is to be extracted from the number 7, and a fraction approximated with two decimal digits, one sets two sections, or four wheels, to zeroes, and the given number 7 is set in the third section, that is, on the 5th wheel of the uppermost row. To distinguish between the number actually given and the zeroes attached to it, a moving hand always slides out under this sign where the actual number has been set, which warns the operator how many digits for a decimal fraction he has to cut from the right hand side on the crank row in the carriage. This way, then, when a given number is under the third sign, one has to unfold the third crank and perform the operations as above. The root will, then, result on the 3 crank wheels in the carriage, as number 264. Cutting off, following the hand’s warning, two digits for a decimal fraction, will mean 2 wholes and 64 hundredths. In addition to that, in the uppermost row there is number 304, as a numerator, and in the second row of the carriage, 529, as a denominator of the ordinary fraction of the tenth units of the first order. At the beginning of this treatise I explained that in our ordinary calculus, there is no convincing test that in our mental operation there was not any error, and that a way of testing by reverse calculation does not constitute a sufficient proof. The same remark applies to the operation of the Machine. In case the Machine, due to damage, produced a false result, then the test by a reverse operation would not be proving, because the same damage that caused a false result in Multiplication, for example, would have affected a false result in Division, which would be clear even from the composition of the Machine. But to remedy this, I devised for the Machine a completely different kind of test, which is an absolute proof. Two rows of wheels with Roman numerals, mentioned above, located on top of the Machine, are designed for this purpose. To obtain such a reliable test, one proceeds as follows. Regarding Multiplication: Since from all the factors, the numbers of the factor on the uppermost row disappear during the work, being replaced by zeroes, so to make it visible after the work, what factor was a part of the problem, one sets in advance, on a Roman numbered row located above the apertures of the lowermost row, the signs corresponding to the digits of the factor which is to disappear. And because after completing the operation, the product results on the uppermost row and on the lowermost row there are zeroes, so one shifts as many zeroes to the number 9 as the number of digits of the remaining factor in the Roman numbered row, except of the first digit, being meaningful, at the right hand side of the factor, where the appearing zero remains. After this, the operation of testing begins. The carriage moves to the left and will stop by itself at the last number 9, but the rotation lasts as long as the number appears that is equal to the Roman numeral right above it, that is, the same which previously disappeared. At that time, one presses the flap on the right hand side of the carriage, the carriage moves to the right and the rotations proceed further, as before, until a given factor fully appears on its first place, that is, on the lowermost row. If after this work it turns out that there are as many digits in the factor on the lowermost row, as the number of zeroes on the uppermost row, at the right hand side, and the numbers following them are equal to the numbers on the crank row of the carriage, then it is an absolute proof that the first product was true, otherwise it had been false. In Division, the test is conducted as follows. When the dividend is set on the uppermost row, at the same time on the Roman numerals row above it, the same signs are set, so that the dividend, which disappears during the work, that way be preserved; and when after completion of the division, the quotient appears on the lowermost row, it is then moved to the Roman numerals row directly above it. Then one moves the carriage towards the left hand side, until the first number of units on the carriage appears in front of the last number of the quotient. The rotation is conducted in this place, until the carriage moves by itself towards the right hand side, and this continues number by number, until the carriage moves to the first number of units, where one has to rotate as long as a zero appears. After completing this operation, one moves the carriage to the left as long as its first number of units passes all the digits of the preserved quotient. When the carriage is moved thus far, one has to watch if the number on the uppermost row, which has now formed, combined with the number on the crank row of the carriage, will match the dividend preserved on the Roman numerals row, which is a positive proof that the first result was true, otherwise it had been false. The test of extracting roots is conducted the same way as in the division, except that right before making the test, one has to adjust the Machine from the state of extracting roots to the state of arithmetic operations, and then set on the lowermost row the number equal to the root resulted in the crank row of the carriage. The remaining steps and the proving test are the same as in the division testing. Remark: I am ending this treatise with a remark that since the Mechanics is an Opener to [meeting] our needs, insofar that not only our physical power but even that of mental power can replace, thus we should put our strongest effort to propagate ingenuity in such a broad and useful field, not venturing, however, into a search for perpetuum mobile, that is, an eternal motion, since this is an incurable disease of Mechanics, just as a philosopher’s stone and an inextinguishable fire in Chemistry, and a squaring of a circle in Geometry—all thoughts in this area have an attribute of an ineffective stubbornness. Let us better strive to make progress in mechanical matters showing promise, since such conduct paves the way to the well-being and glory of the Nation.